In Japanese usage, the word Mecha can refer to any kind of mechanical device such as a gun or a robot. In the world of anime and science fiction, this word has made international career as a general designation of fantasy war machines approximating the shape of a human body. The genre is broad: if it is fun, robotic and has the imaginative nature of working technology not yet in existence, it’s Mecha. 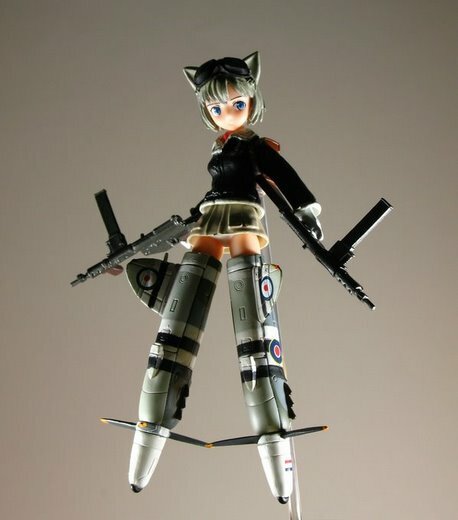 Mecha Musume is the term coined by Humikane Shimada for designs that combine anime girls and military hardware. They commonly feature cat-ears, and rarely (if ever) pants. This one clearly brings associations with the Spitfire. It’s just one more of these random design concepts from Japan that proves something doesn’t need to make sense to look good. I like it. Do you? Check out more interesting toy mashups by Don Solo on Flickr.